Over the years, several homeschooling moms have asked my advice on how to teach writing to their teens. I’ve never felt confident recommending a single resource in the past, because I haven’t come across a comprehensive, well designed program. Teaching high school writing can be intimidating, but after working our way through High School Essay Intensive from Institute for Excellence in Writing with my daughter, I know that it doesn’t have to be a frightful undertaking. I am thrilled that I can finally point homeschooling moms in the right direction when they ask what I recommend for teaching writing. What is IEW High School Essay Intensive? High School Writing Intensive is a video based course that walks your student through the process of writing essays step-by-step. More than half of the course focuses on general principles of essay writing, covering everything from how to structure a 5-paragraph essay to how to gather and organize your content efficiently. The second half of the course covers how to prepare for the SAT / ACT essays (they are not the same!) and how to write personal essays for college and scholarship applications. Since the class is video based, students can sit down and spend an entire day working through the material, or space it out and move at their own pace. 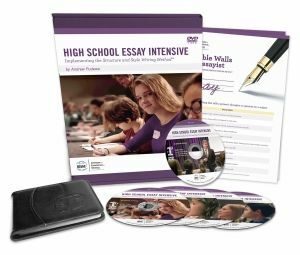 For the purpose of this review I received the High School Essay Intensive Package, which included 5 DVDs, Student Handouts, Portable Walls for the Essayist, and access to the streaming version of the video instruction. The course covers high school essay writing from start to finish and is intended to be used with students in grades 9 through 12. How Can IEW Help Your High School Homeschooler Master Essay Writing? This program goes far beyond the basics and provides students with detailed instruction on creating a solid structure for their essays, right down to how to structure a paragraph when writing academic essays. When the essay structure is clearly defined and understood, writing becomes less intimidating and students can then explore writing with style. Guidance in dressing up and adding stylistic elements to essays is also concisely taught. Younger students who are just beginning their high school journey will be armed with the tools they need to succeed, while more experienced students will be able to expand and deepen their communication skills. Please note, this course is lecture based and students will need to take notes and practice the methods presented in order to master the art of the essay! My oldest daughter (17) and I worked through this program, paying extra close attention to the SAT essay preparation. Although she is already well practiced in many types of essay writing, she found the organizational tips and structure recommendations extremely helpful. She was able to walk into the SAT last Saturday feeling completely prepared for the essay portion of the test. She is confident that she did well, because she knew exactly what was expected in her essay. To be fully prepared for standardized tests, college applications and college level writing assignments, mastering written communication is essential. We not only enjoyed this course, but I feel it is an essential resource in our homeschool and will use it going forward in teaching my two younger daughters. I learned some new things as well and am looking forward to putting these skills to use in my own writing. Overall, High School Essay Intensive offers a comprehensive training that your student can return to again and again to perfect their skills throughout their high school years and into college.